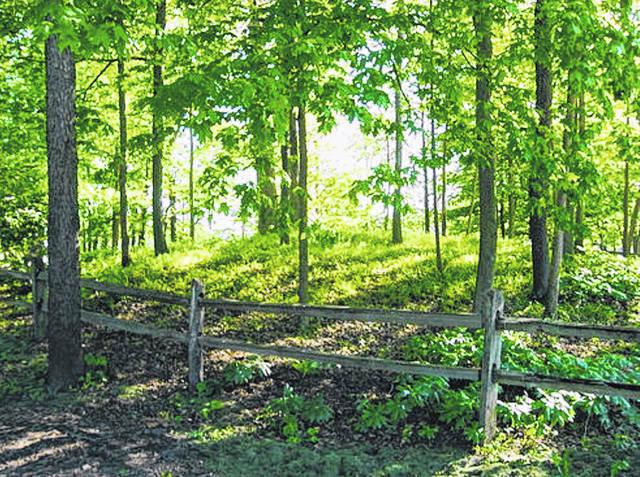 The Indian Lake Area Historical Society has formed a mound committee to preserve the prehistoric Hopewell burial mound. 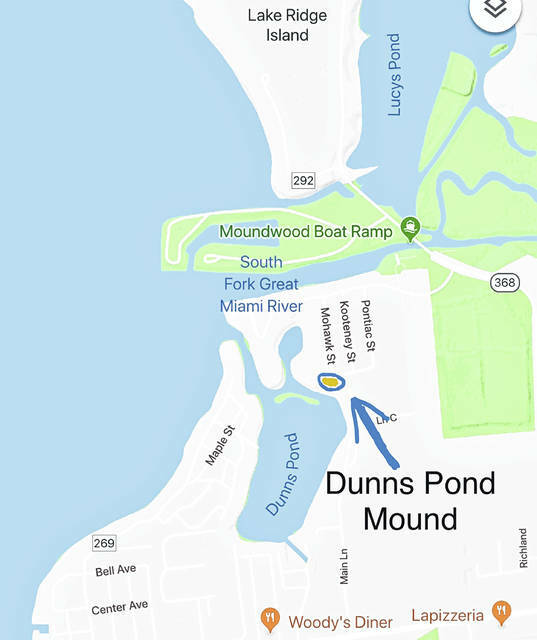 Here is the location of the prehistoric Dunns Pond Mound at Indian Lake. Did you know that Indian Lake has a prehistoric Native American mound? Actually, this is a little known fact to many in the area. The mound was listed on U.S National Register of Historic Places in 1974 and is believed to have been built by the Hopewell Native Americans at some point between 300 BC and 600 AD. The mound is located just outside Huntsville in Washington Township near the northeast side of Dunns Pond on the edge of the small community of Moundwood. The mound is no longer accessible and is on private property. It is believed the mound was built as a “charnel house” by the Hopewells for death rites. A charnel house is a vault where human remains are stored. After the Hopewells, it is believed the “Late Woodlands” people also used it as a burial site. Although many more prehistoric mounds are believed to have existed in the area, they all most likely were submerged when the Miami River was dammed in 1860, enlarging Indian Lake to support canal traffic. When the lake was dammed, farmland became the bottom of the lake and hills became islands. When this occurred Dunns Pond Mound suddenly was near the shoreline of the newly enlarged Indian Lake. This small bay of the now larger lake immediately south of the mound was later named Dunns Pond. Dunns Pond was little known for a long time after the damming and expansion of the lake. It was surrounded by woodlands for many years. Archeologists attempted excavation in the early 1940’s but after yielding no significant finds, attempts ended. The mound though, did continue to receive attention from archeologists and in 1974 it was listed on the National Register. The Dunns Pond Mound is believed to have been used as a burial site for as many as 9 centuries. According to the Indian Lake Area Historical Society, it is one of the oldest man-made structures in Logan County and it is the largest known structure that still remains of the people who inhabited the Indian Lake region prior to the arrival of the Europeans. The Indian Lake Area Historical Society has formed a mound committee and is seeking to preserve the historical ancient burial site. Volunteers have already started on preservation and clean-up efforts at the site by cutting down unwanted trees and removing debris, brush, fence posts and rails.